Our goal is to correct problems in your spine instead of just covering up symptoms that can sometimes be misleading. However, before we can correct your problems, we need to locate them. Chiropractic instrumentation is the key to determining the presence or absence of these problems called vertebral subluxations. 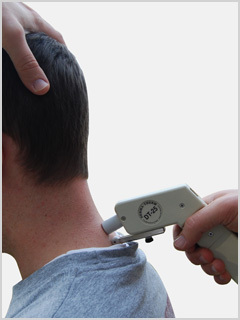 All examinations at our office begin with a non-invasive scan with our thermographic instrument, which records fluctuations in radiant heat along your spine. These fluctuations are indicative of musculature irritation and blood flow anomalies generally associated with a vertebral subluxation. Understanding the information provided by the thermographic instrument eliminates the guesswork and allows us to give you quality, specific adjustments so you can get fast, lasting results.